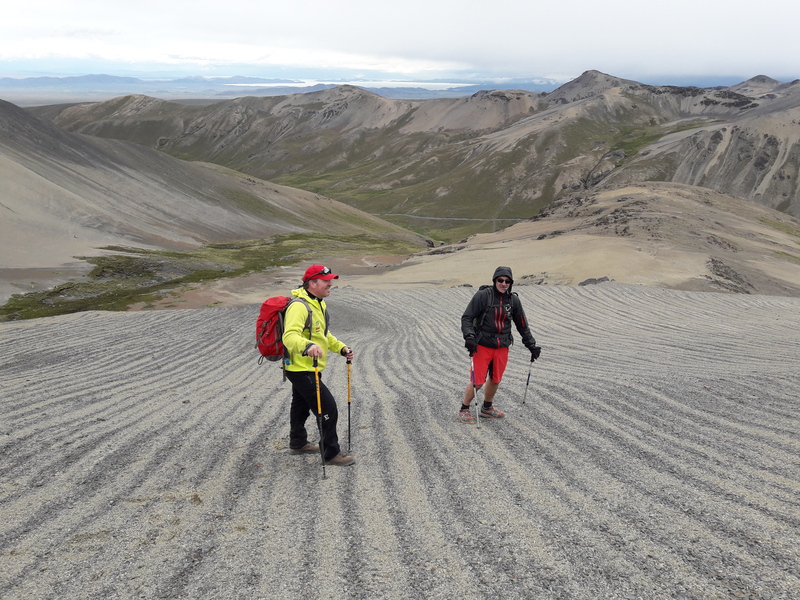 Join Jaime, IFMGA certified guide, in this 5-day hike through the impressive Cordillera Real. The first destination is Tuni, just one of the area's wonders! The Condoriri massif is part of the impressive Cordillera Real, a region of the Andes, in Bolivia. 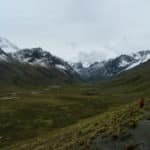 I planned here a 5-day hiking tour in the area of Condoriri. In fact, the starting point of the trek itself is the beautiful Tuni. From Tuni, we will progress through some famous lakes in the area. First we will reach Laguna Jurikhota. In fact, a highlight of this location is the wonderful sight of the Condoriri massif. Then we will go to the glacial Laguna Congelada, to Laguna Chiarkhota and Laguna Wichu Khota. 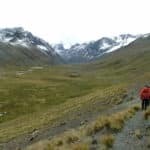 During the trek we also enjoy the wonderful views over Imilla Apachita, Maria Lluko and Huayna Potosi. On average we walk 4-6 hours per day, therefore you need to be in good physical shape. 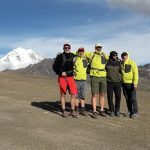 Do you want to join me in this 5-day hiking trip in Bolivia? Then contact me for more information! 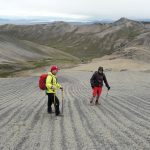 And if you have more time in the area, why not going on this 8-day hike? We leave from La Paz by private vehicle at 8AM. After 3 hours we reach the Tuni village, the starting point of our trek. 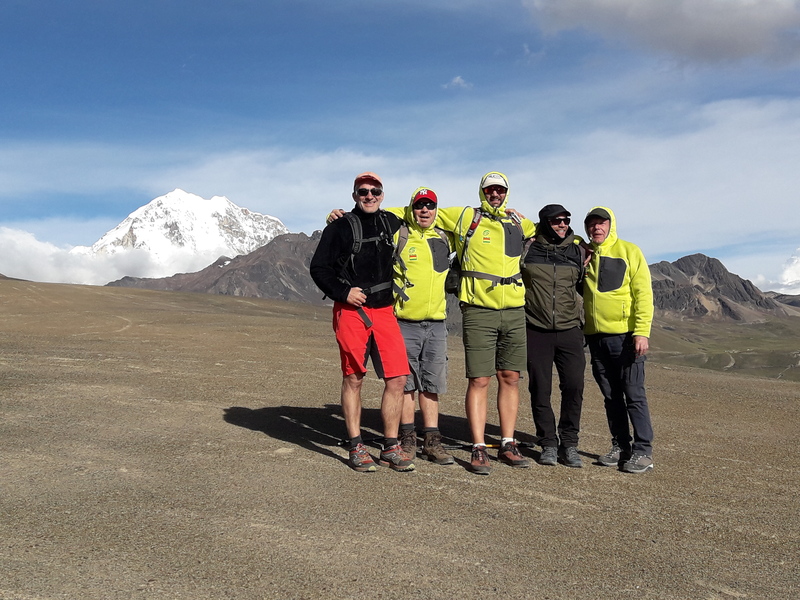 After going by the Laguna Tuni, we reach a pass at 4900m. Then we go down until the Laguna Jurikhota. There are beautiful views of the “head of the Condor” (5648m), forming, with its 2 adjacent summits, the Condoriri massif. It has the shape of a condor with folded wings. From the lake we go up a steep hill to reach the small Laguna Congelada. Here, two glaciers literally fall in the frozen water. 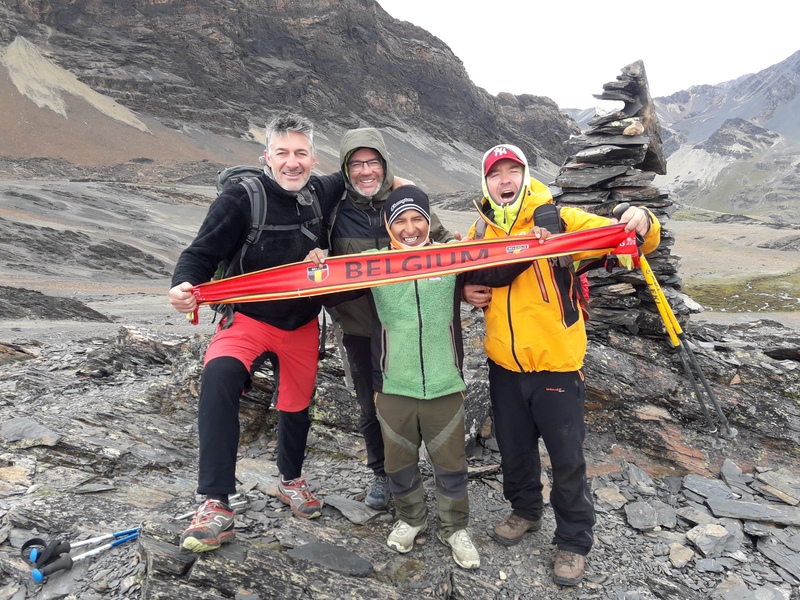 It’s a jewel at 4900m, at the foot of Condoriri (5650m). Then we reach the Austria pass (5120m) and we go back to the Laguna Chiarkhota (4670m). It’s the base camp for the ascent of Condoriri and Pequeño Alpamayo. Before the pass, we can ascend the Austria peak (5300m), which offers sublime views over Condoriri and the Cordillera Real (45 min ascending and 20 min descending). We leave Condoriri behind and start at the foot of the Black Needle until the Jallayko pass (5025m). We are in a beautiful valley, Jistaña. Then we go up to the Tillipata pass (5000m). From there, we enjoy amazing views of the lakes, a great reward for all the effort. 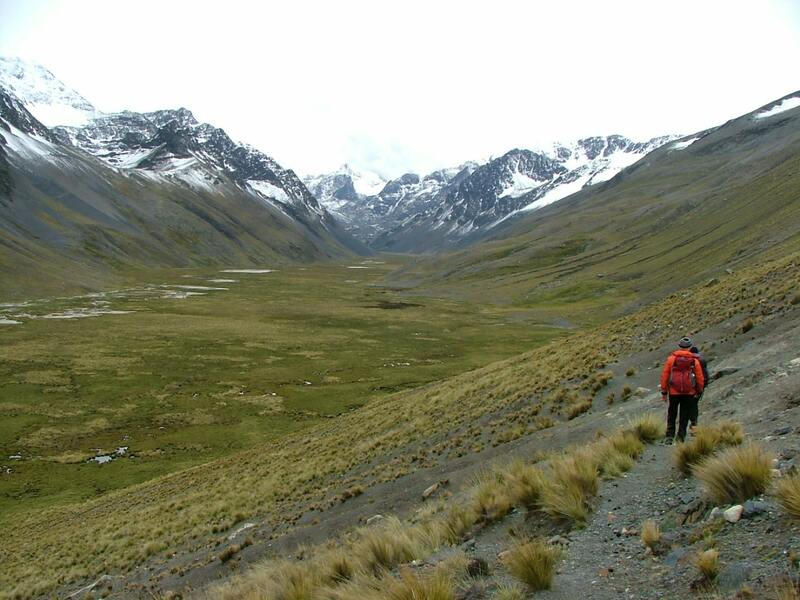 Then we descend to the Laguna Wichu Khota, where we set camp at the foot of María Lloco (5522m). We move between the lakes until the old camp of the Santa Fe mine. A short detour to the small summit dominating the camp allows us to admire the lakes one more time. 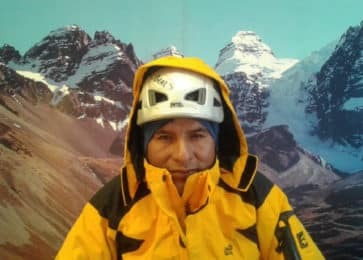 We ascend until the camp, surrounded by the summits Imilla Apachita, Maria Lluko and Huayna Potosi (6088m). The views are breathtaking! Optional: continue until the Huayna Potosí glacial lake. The path here is a true belvedere. Today we reach the Milluni pass (5000m). The Milluni valley opens up. 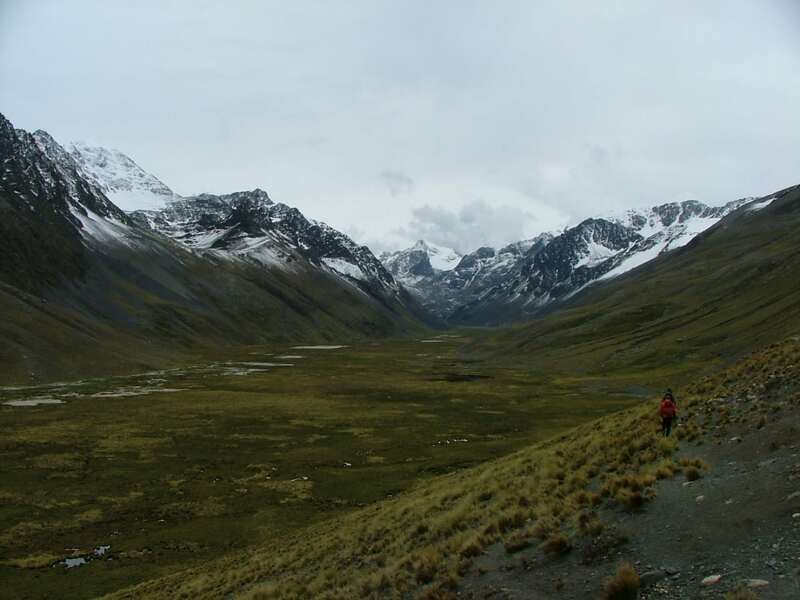 We go around the Huayna Potosi to our left before reaching the valley, that we follow until the refuge (4700m). We return to La Paz by 4×4 private transfer. We will have a cook and there is an option for vegetarian food.